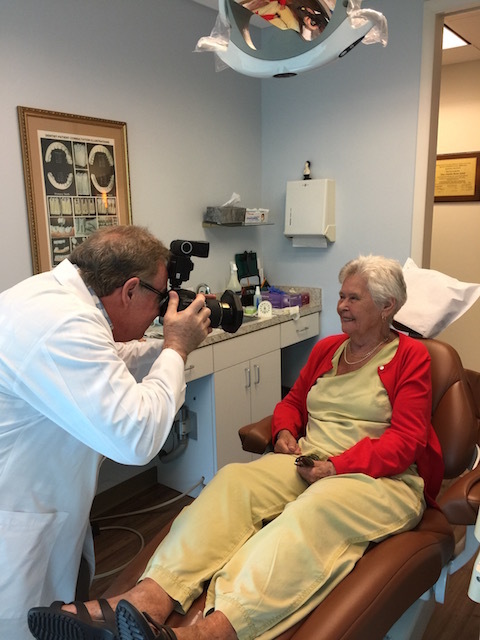 So here we have part two of the saga of Travels with Mary – our second trip to Fort Lauderdale. Another great flight with Watermakers Air from North Eleuthera to Fort Lauderdale Executive Airport – a quick taxi ride to the hotel and then I picked up the rental car – yes this time I fortunately did remember to check that I had my drivers license with me ! A short rest for Mum and fortified with a little sushi we then took off to Aventura shopping mall for more retail therapy. As it is tiring for Mum to walk very far I had decided to pick up a wheelchair to whizz her round the shops. A great service – fill in a form at the concierge desk and then you have free use of the wheelchair. This was my first real experience of wheelchair manouevres and I have to say it is pretty difficult ! A lot of the shops are not ideally set up – the walkways can be rather narrow – but the thing that struck me most was actually how unsociable being in a wheelchair can be. Mum is hard of hearing at the best of times and after the flight her hearing is extremely poor so I had to keep on bending right over to talk with her. I did wonder whether the design of a wheelchair that faces the person pushing it might be an improvement. Anyway that is just a little musing on my part ! 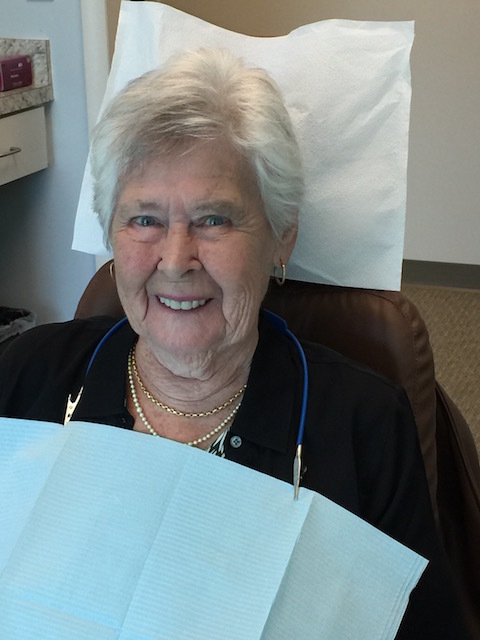 Look at that lovely new smile ! A very successful visit resulted in my Mum now sporting a pair of RayBan sunglasses and kitted out with some new sandals and tops ! I am going to the UK in November so I found some very comfortable and cosy boots to wear as well…. Definitely a future blog or two on that trip ! We ate supper at Brio – a restaurant chain in Gulfstream Park Aventura. Mum had a bowl of lobster bisque and I had a mushroom ravioli. An early night and then up to visit the dentist the next day. Three extractions later and dentures fitted she looks a treat. 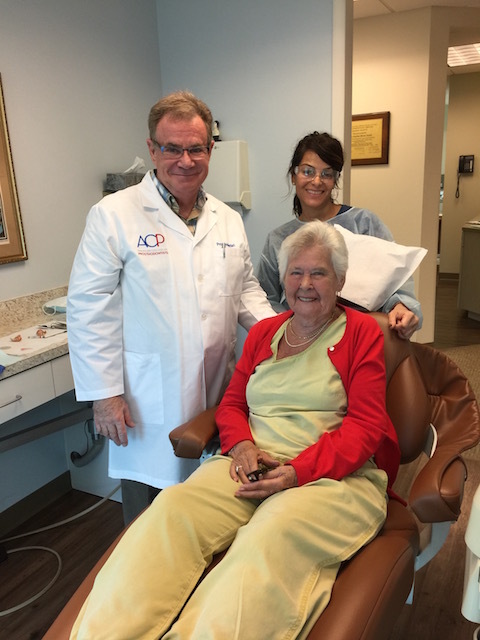 Doctor Stone did a great job – now they just have to bed in and then she is ready to take on what any restaurant can throw at her ! As a treat afterwards we went to the Red Door Spa and had manicures and pedicures together. 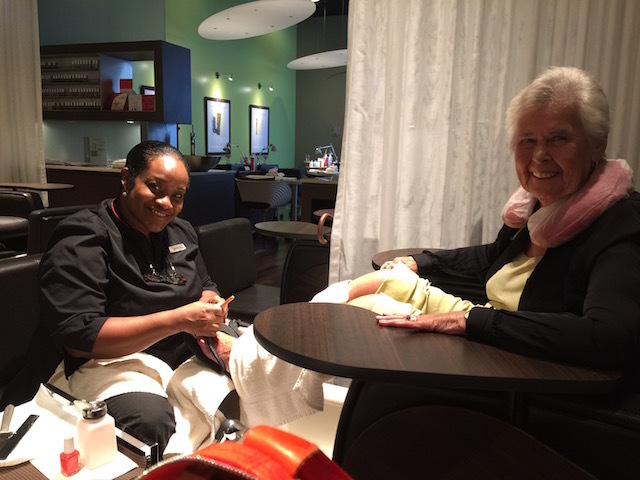 The technicians who did them were a real tonic and made Mum feel pampered and special – so what with her new clothes, smile and all the pampering she is getting she is ready to go back to her hectic and glamorous life in Eleuthera – just joking……. For me the whole experience has been a valuable one – the kindness of many people along the way during these two trips has been a real gift – and to have the chance to make my Mum feel better and face some of her worst horrors – cities, travel and dentists – and come out smiling at the other end has been a delight. Rudge was boarded out again to Dan and Larry’s Doggy Day and Night Care – and many many thanks to them for taking great care of him. 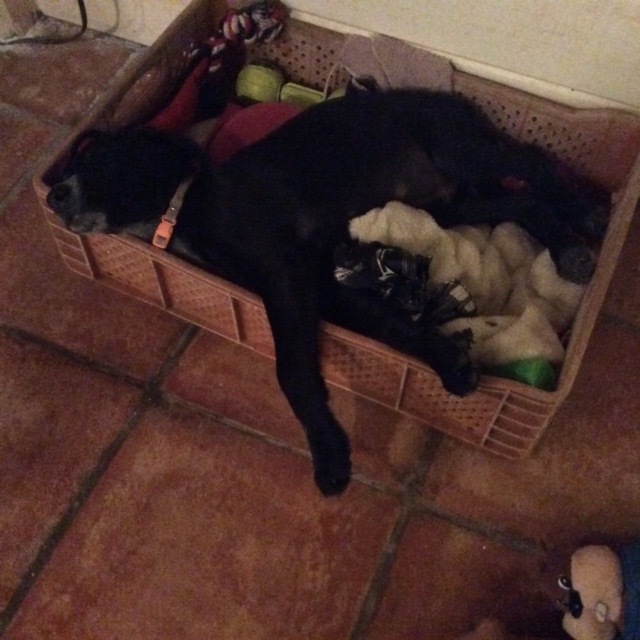 of course he just loves being with Rufus and Willie – check out the picture of him passed out in their toy box ! All that fun was just exhausting…..
Rudge passed out in the toy box – just too much fun…..
Cupid’s Cay CELEBRITY Doggy Spa, if you please! A pleasure to serve….and the pups just have a ball together….literally and figuratively! I really enjoy hearing about your life in and out of Eleuthera! Who is taking care of Mary when you go to the UK? 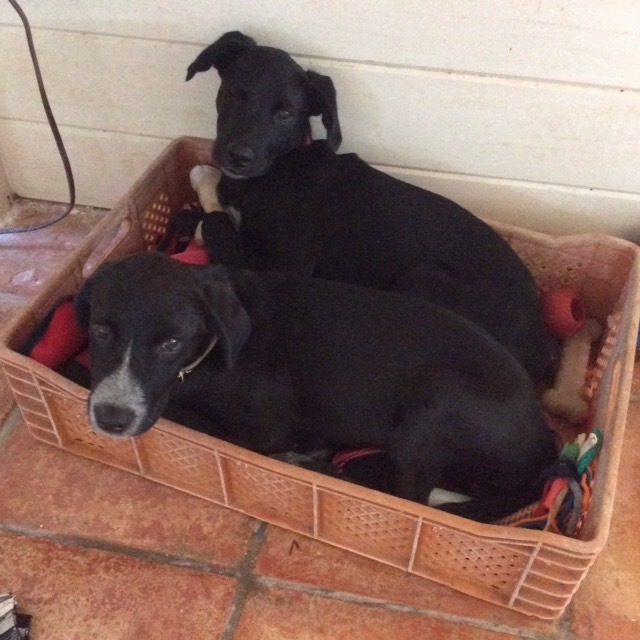 My husband Bob will be here to look after her – he does a great job when I am away …. I am going solo to London ! You are an exemplary daughter! Very kind of you to say so – we try our best !